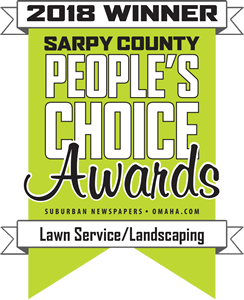 In Omaha, as in other areas, great looking, healthy yards are created by providing the best growing conditions based on a solid foundation of inputs such as fertilizers, water, seed, and other landscaping products, when necessary. Core aeration – which can be performed in the spring or fall – improves your lawn’s health and beauty, optimizes root development and reduces thatch and associated problems. Aeration deepens your lawn’s root system for greater resistance to disease, insects, drought and heat stress, improves drainage and improves air, fertilizer, water movement. It can also help reduce water usage at your Omaha residence. For best results, overseeding is performed in conjunction with core aeration. Reduces Soil Compaction: Grass in compacted soil grows slowly, lacks vigor and becomes thin or does not grow at all. Core aeration removes small cores of soil, depositing them onto the surface of the turf. This improves the depth and extent of grass rooting, and it can help save money on your water bill. Improves Turf Grass Rooting: Deeper, healthier root growth. Soil that is severely compacted calls for on going aeration. Soil compaction is not going to be solved with one service. Seriously compacted lawns may need to be aerated two or three times a year, both as a preventative and curative measure. No one can estimate how long the benefits of aeration will last. Experts agree benefits increase with each service. The best time overseed is in the fall immediately after aerating. We recommend overseeding every fall.